This year, the family of Rakesh Pillai, a bank employee, achieved a long-held aspiration. After hauling themselves around on bicycles and scooters all their lives, they bought a white Suzuki Wagon R, one of India's best-selling compact cars. It didn't matter that no family member knew how to drive. 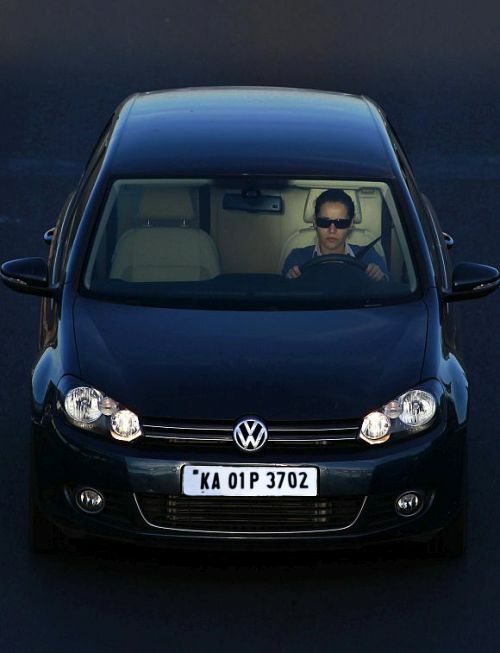 Pillai immediately took the car for a spin around his neighbourhood in New Delhi. He almost knocked down a couple of pedestrians, scratched a car door on a gate when making a turn, and bumped a wall while trying to reverse. "In India, the main rule for most drivers is that you don't stop for anyone," said Pillai, 31, who wears frameless glasses and sports a neatly trimmed moustache. "Cars don't stop for walkers, and walkers don't stop for cars." India has the world's deadliest roads, the result of a flood of untrained drivers, inadequate law enforcement, badly maintained highways and cars that fail modern crash tests. Alarmed by the increasing fatalities, the new government has begun a five-year project to cut road deaths by a fifth every year, part of the most ambitious overhaul of highway laws since independence in 1947. About 1.2 million Indians were killed in car accidents over the past decade, on average one every four minutes, while 5.5 million were seriously injured. While road deaths in many emerging markets have dipped even as vehicle sales rose, Indian fatalities have shot up by half in the last 10 years. 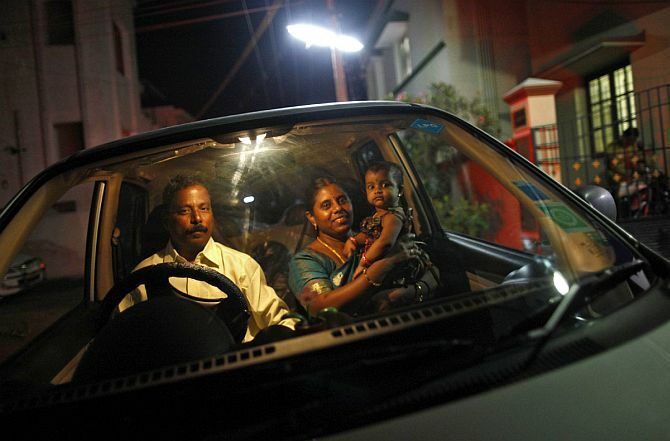 Image: R. Umamangeshwari, a 42-year-old housewife, holds her adopted daughter Janani (R), a cradle baby, as her husband drives a car outside. The government is proposing a drastic increase in fines and prison sentences for dangerous driving. It will create an authority with a sole focus on road safety, impose stricter regulations on car manufacturers, and employ technology, such as automated driving tests, to cut down on corruption. Drivers caught speeding or who drink and drive will face a fine of $800 (about Rs 50,000) - 10 times the average monthly salary - and the threat of jail. The current maximum fine for speeding is $16 (about Rs 1,000) and for drink driving $50 (about Rs 3,000). "It is not going to change road habits overnight, and any success will depend on a lot of work from the government to ensure these laws are implemented," said Piyush Tewari, who founded the SaveLIFE Foundation to reduce accidents after his teenage cousin was killed in a crash. The new law was inspired by the death of Rural Development Minister Gopinath Munde in a crash in June. Munde, a close ally of Prime Minister Narendra Modi, was the third senior politician to die in a car accident since 2000. The legislation, to be introduced in a parliament session starting this month, will be a test of Modi's ability to win cross-party consensus because he lacks an upper-house majority. At a test centre in Delhi last week, Pillai stood in a queue that snaked outside into the autumn sunshine, where touts told candidates they could skip the line and the test for a fee of about $30 (Rs 1,800). After an hour, Pillai was called for his test on a busy road near a shopping mall. It involved driving in a straight line, pulling into a right-hand lane, making a U-turn and then another, before arriving back at the start. It took all of 90 seconds. The examiner, standing under an umbrella, didn't get into the car and tried to keep track of more than 10 vehicles and motorbikes taking the test at the same time. India has one the world's fastest-growing car markets, with two million sold every year. In a nation of new drivers, much of the road etiquette has come from how people walk. Drivers seize any space in front of them and tailgate whenever possible. On the highway, if drivers miss a turn, they stop, back up and try again. Adding to the danger, drivers share roads with camels, elephants, bullock carts, trucks, tractors and cyclists. Roads are pot-holed and pedestrians dart out into traffic. It is common to see broken glass, overturned trucks and crumpled cars by the roadside. Cutting road deaths and injuries could add three percentage points to India's economic output, the World Health Organisation estimates. 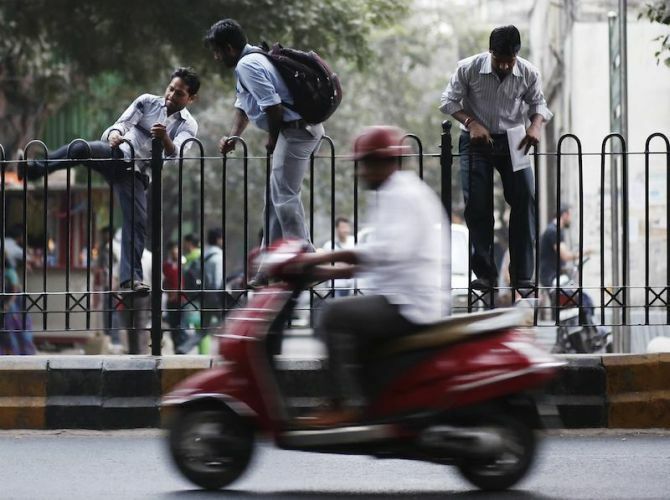 India has few drivers relative to its population, with just 41 automobiles for every 1,000 people. That is roughly equivalent to the figure for the United States in 1917. But the numbers promise to keep soaring. "Sadly, I predict we are going to keep seeing a spiral in road deaths," said Harman Singh, of safety campaign group Arrive Safe. "It is easier to pass a law than to change the mindset."